From Goliad I continued my western trek and arrived at Fort Davis, TX a tiny town of 1000 Texans which is named after a famous Army fort from the Indian frontier days. 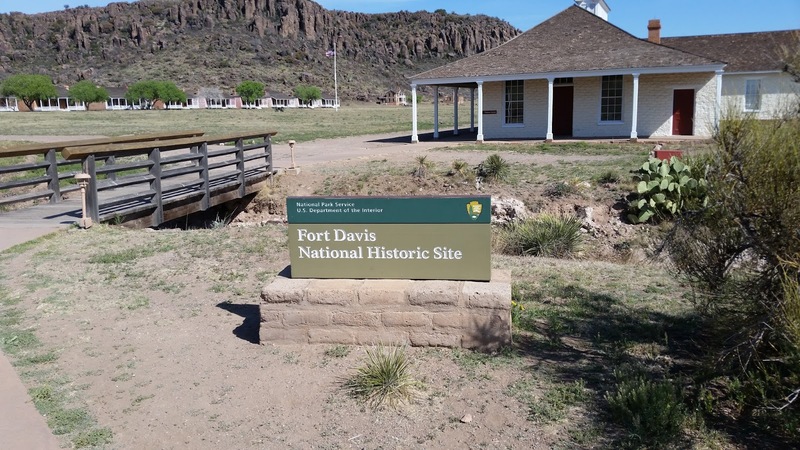 Fort Davis was established in 1854 and was occupied by US Army troops until 1861 when Texas succeeded from the Union and became Confederate territory including the area around Fort Davis. The troops at the fort tried to get back north to Union territory but many were captured and spent years in a Confederate prison in San Antonio. 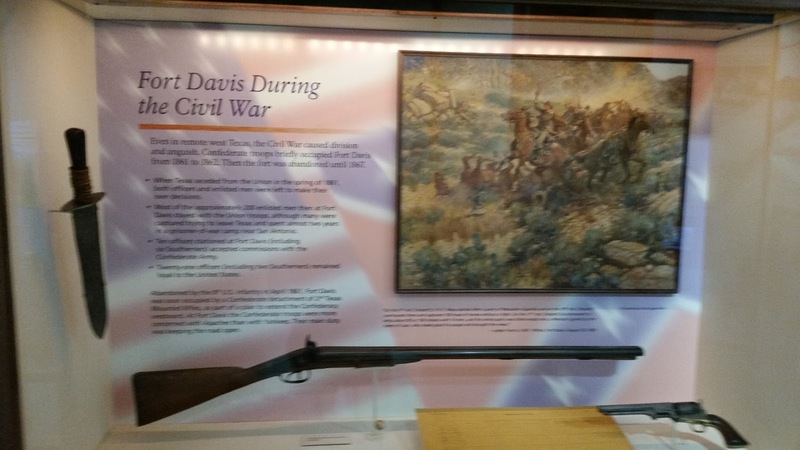 Confederate troops then occupied Fort Davis until being driven out by a California-based Union force in 1862. Union troops promptly abandoned the fort and it remained unoccupied until 1867. 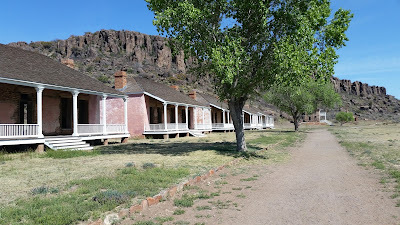 After the Civil war traffic along the San Antonio - El Paso road once again was targeted by Apache and Comanche raiders so Fort Davis was reestablished to protect the settlers pushing west. 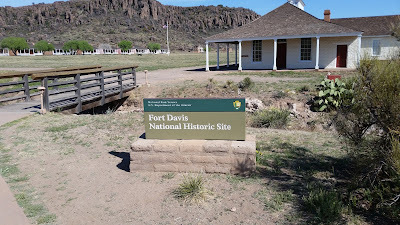 The entrance to Fort Davis Historic Site. 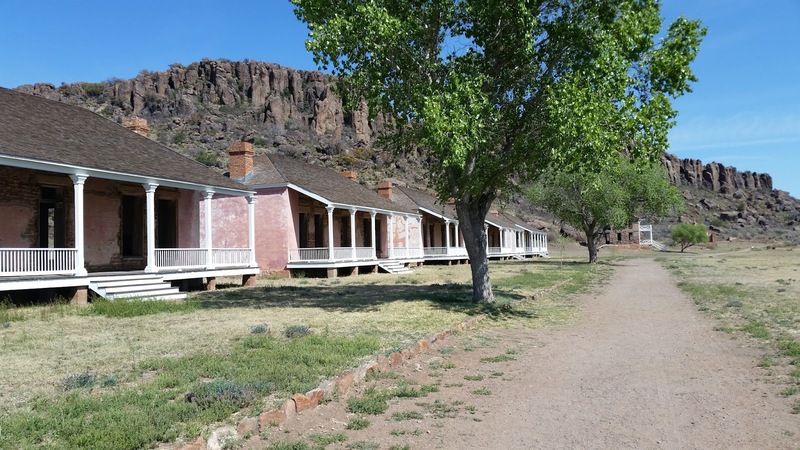 The visitor center is within the enlisted men's barracks and is the white posted building in the photo above. Entrance fee is $7.00. 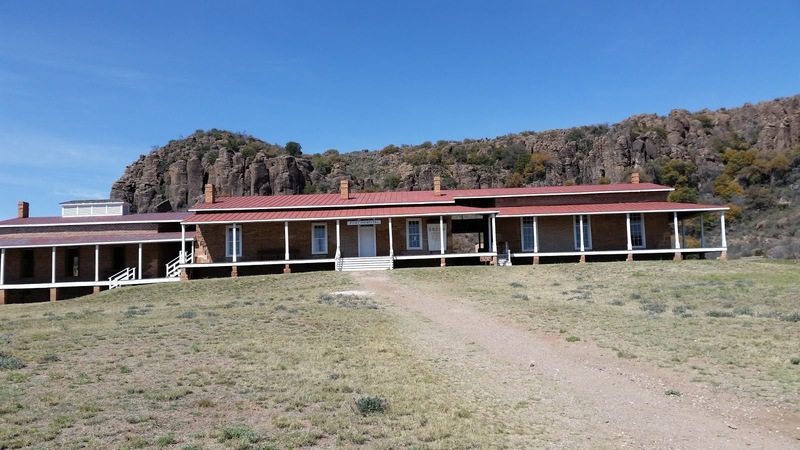 Within the visitor center is a small museum with displays depicting scenes from Fort Davis in the 1800's. 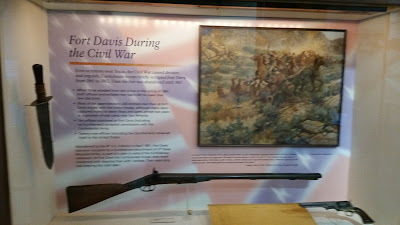 One of the museum displays at the visitor center. Whenever I think about Army forts in the west I always picture log walls with guard blockhouses on each corner but that wasn't how Fort Davis was constructed, probably for lack of trees. It was a group of buildings built in a three-sided canyon with the southern face being open. Officer quarters, some of which you can tour. Note the cliff in the background. A second enlisted men's barracks has been set up as an adjunct to the museum and holds larger items. A cannon display within the enlisted men's barracks. After the Civil War Gatling Guns capable of firing up to 300 rounds per minute were standard equipment for Army units. 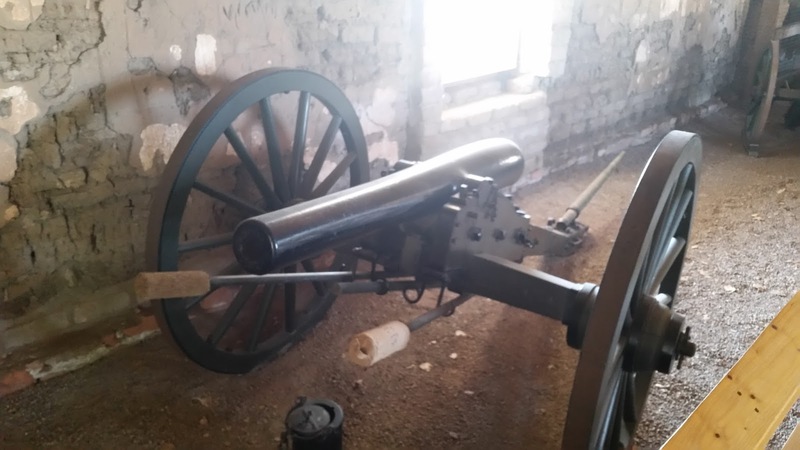 This gun was never fired due to lack of ammo to practice fire it. 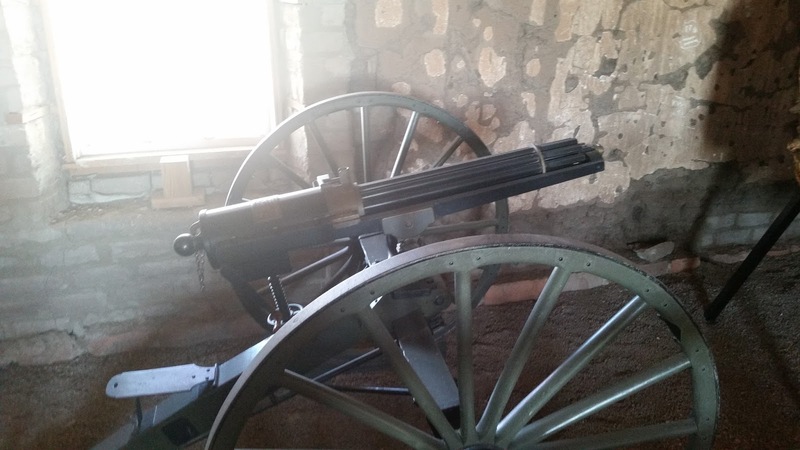 The display sign said when a lieutenant asked the Fort Davis commander for permission to practice firing the Gatling gun he was told he could but he'd have to pay for the ammunition out of his own pocket -- so the gun was never fired. There was a group of volunteers that dress up in authentic uniforms and civilian clothing from the 1870's and stay in character when or if they interact with the site's visitors. Being able to tour through some of the furnished officer quarters and especially the post's hospital was really interesting. The post hospital. It contains displays of medical practices from the 1870's. 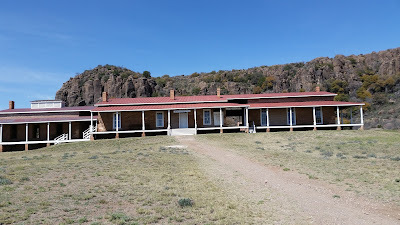 Readers of this blog know I'm a sucker for history subjects so you probably guessed I really enjoyed touring Fort Davis. It's not exactly "on the way" to anywhere but there IS a very nice Texas State Park (more about that in my next post) within five miles of the Fort that could be a trip destination. If you're in the area don't miss the chance to tour the historic site.